KANSAS CITY, Mo. – The opening of a new special exhibition, A Centenary of Australian War Art, and related programming, including a visit from the Australian Ambassador and the American premiere of an acclaimed documentary film are among the July events at the National World War I Museum and Memorial. A Centenary of Australian War Art, a new special exhibition, opens on Friday, July 17 in Memory Hall. The exhibition features the most comprehensive collection of Australian war art ever seen outside of Australia. The Australian ambassador to the United States, Kim Beazley, will visit the Museum on July 16 for an evening private reception as part of the exhibition opening. In conjunction with the new exhibition, award-winning producer Marian Bartsch travels to Kansas City for the U.S. premiere the documentary The Waler: Australia’s Great War Horse at the Museum on July 23 at 6:30 p.m. Following the free screening, Bartsch will participate in a Q&A session with attendees. The next two programs in the Iraqi Jewish Archive Speaker Series will be held during July at the Museum. Presented in conjunction with the exhibition Discovery and Recovery: Preserving Iraqi Jewish Heritage from the Midwest Center for Holocaust Education at the National Archives (through Aug. 15), Dr. Mark Cohen will discuss the historical role of Jews in Iraq on July 1 at 7 p.m. On Wednesday, July 15, at 7 p.m., Corine Wegener, the Smithsonian’s Cultural Heritage Preservation Officer, will address the process of saving the Iraqi Jewish archives. Both events are free to the public. On July 24 at 6:30 p.m., the Museum will hold a free advance screening of the season finale of The Crimson Field in partnership with KCPT. The hit PBS series follows the lives of a team of doctors, nurses and women volunteers who work together in a tented field hospital in France during World War I healing the bodies and souls of men wounded in the trenches. Other events during the month include Hands-on History every Wednesday and Friday at 1 p.m. in which history is brought to life during this family-friendly program where kids of all ages are invited to handle Great War artifacts. Living Historians present Day in the Life on Sunday, July 12 in which they will discuss what life was like for soldiers serving on the Eastern Front in 1915 using meticulously re-created period attire. The Museum’s latest offering for the In the Know series on Sunday, July 19 at 2 p.m. features award-winning children’s author Anola Pickett and Museum Archivist Jonathan Casey discussing the art of writing and the role of research in both historic fiction and non-fiction. Anzac Cove was the principle landing area of the Allied Forces on April 25, 1915 on Gallipoli (Çanakkale, Turkey). Moore-Jones landed at Gallipoli in the British Section of the New Zealand Expeditionary Force. He was not officially designated a war artist in the Australian program but attached to Sir William Birdwood’s ANZAC printing section he painted the landscape of the peninsula. 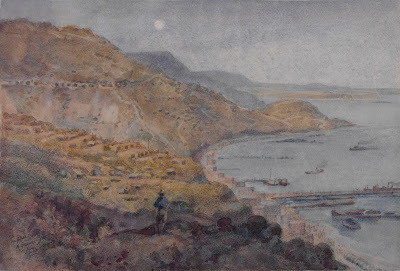 Crozier was one of the few artists in the Australian Imperial Force who had experienced first-hand the heavy fighting of the war, starting at Gallipoli in September 1915. 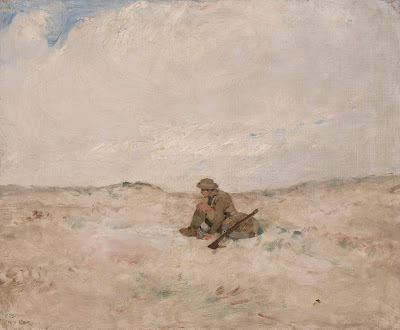 In Dead beat, his experiences come to the canvas in the person of the solitary soldier who sits alone in the middle of the Somme landscape, exhausted from war. 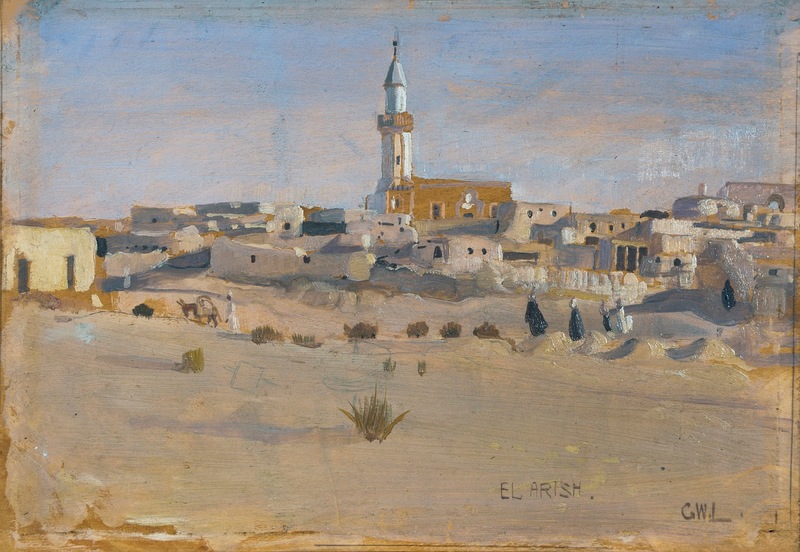 Charles Bryant was appointed an official Australian war artist in 1917. 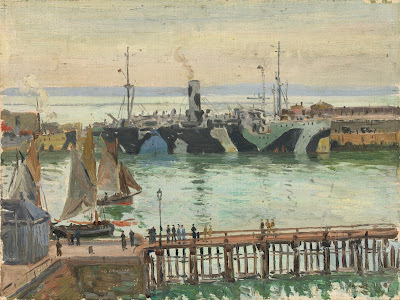 He was commissioned by the Australian Imperial Force (AIF) to depict the embarkation and disembarkation of Australian troops at Le Havre and Boulogne in France. 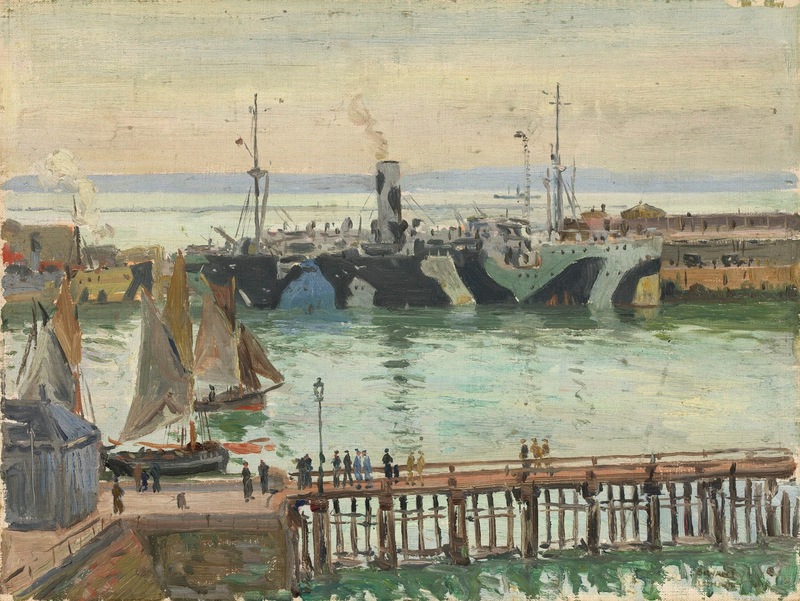 The camouflaged hospital ships were painted in this fashion to make the ships harder to sight as a target by German U-boats (submarines). 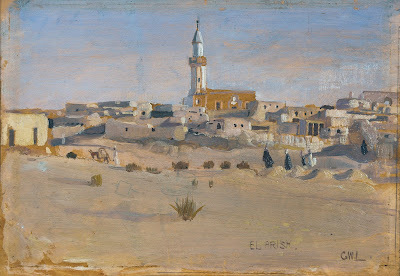 El Arish was a large village on the coastal route across the Sinai Desert about forty five miles southwest of Gaza. It was captured by British forces on December 21, 1916 from the Turks.